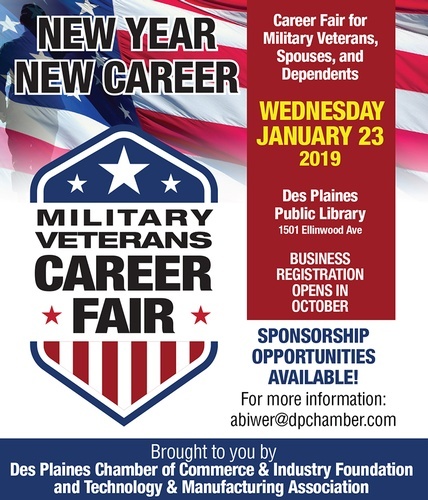 Des Plaines Chamber of Commerce in partnership with the regional business community presents: Veteran?s Back to Work Boot Camp CAREER FAIR. This career fair is specifically targeting Military, Veterans, Spouses and Dependents who are looking for new work opportunities in the region. Meet employers with job opportunities in many different fields who want to hire YOU! MUST BE A MILITARY VETERAN, SPOUSE OR DEPENDENT OF VETERAN TO ATTEND! All attendees that pre- register in advance and attend will get entered in a drawing for a BRAND NEW HP Laptop computer that includes Microsoft Office, Gift Card to Jewel and more prizes will be drawn! * Room located on the 1st floor right across the street from the Metra Station. *Semi Private Interview Space Available. Career Fair 2:30- 6:30 p.m..